Old fashioned tent revivals gathered together the souls of the hungry, those wanting something bigger than themselves, those desiring something that could not be bought or sold, only felt, and only experienced. Unwittingly, or perhaps very consciously, Sezio’s Four Day Weekend, which paired four local acts with four up and coming national acts, did just that: they made something bigger than themselves. From the space to the sound, Sezio transformed four days into something truly memorable. The concrete walls of Sushi Art, were barely recognizable, thanks to local artist Wes Bruce. 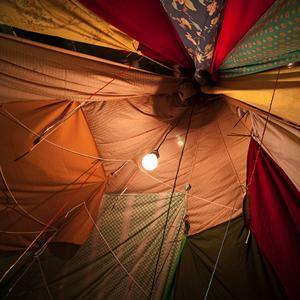 A bright buzz of campy flags and delicate string were wound throughout the rafters, complimented by a patchwork of knotted quilts that turned the space from sterile to sublime. The first night set the stage for a magical weekend of performances by The Vision of a Dying World and The Tree Ring. Jackson Milgaten, of Vision, kicked the night off solo plucking his hallow bodied guitar, singing soothing songs he first heard from his mother and even a number by The Boss. Later, “Little Brother,” (Jackson’s words, not mine) Keith, joined him on stage with the same sense of sacredness, with his hands buried in his pockets nearly the whole time unless they were strumming his Les Paul. Eventually bassist Jermey Scott and drummer, Jona Tellez-Giron slipped on stage, rounding out a jaunty, yet peaceful, and well played set. Soon after, The Tree Ring, fresh from recording in Idyllwild, with a new album under their belt, took the stage for an enchanting set. Magic ensued from The Tree Ring, with the sounds of a lilting violin, a buttery bass, precise percussion and haunting horns, which was crowned with the thick drone of an organ and accented by the honest and clear words of Joel P. West. The band was gracious and seemed happy and humbled to be on stage, and the audience lapped up the full, folky and complex sound. There seemed to be a feeling of reverence through out the night and the whole weekend between audience members and performers alike. Sincerity and gratitude warmed the air, while strains of music, some melodious, some fervent and aggressive, some simple and sweet, but always unforgettable, sliced the air. I for one, found myself “coming down” after the four days were up. I was highly aware of how rare and precious and just plain awesome it was to be around people who share a passion for music and art and community. Sezio’s Four Day Weekend was a creative crusade, filled with performances by the passionate, and hallelujahs from the hungry. Hell, it was practically a revival. All photos by Carly Ealey, view more on her Flickr. Videos filmed by Charles Bergquist, Chadwick Gantes, Brandon Tauszik, and Michael Allen Spear. Sound engineered by Keith Milgaten.